Category Dessert, Thoughts From Fit Paleo Mom and tagged berries and cream., paleo berries and cream, paleo dessert. If there is one thing I have learned from eating paleo it's that you should NEVER be hungry. When following paleo, we aren't counting points, calories, or fat grams. You can eat whenever you are hungry, just eat good food. One reason I love paleo is because I can eat a lot and I still feel good and not bloated and weighed down. I don't weigh myself anymore and I don't worry that I am eating foods that are high in fat. If you are eating a variety of fruits, meats, vegetables, nuts and seeds then you should have nothing to worry about. Some good paleo snacks to have on hand are: fruit, nuts, beef jerky, pork rinds,salami, kale chips, sweet potato chips, olives, left over meat dipped in mustard, hard boiled eggs, salsa, guacamole,dark chocolate, coconut milk, coconut butter, fruit smoothie. Don't let yourself ever get hungry, that's not what paleo is about. This is a really good paleo go to dessert that I have found. It's easy and will satisfy any kind of sweet tooth that you may have. You will need: 1 can full fat coconut milk, 2 tablespoons honey, 1 cup blueberries, 1 cup blackberries, 1 cup strawberries. Put can of coconut milk in the refrigerator for about an hour or two before you want to make it.If you are in a hurry, you can put it in the freezer, just don't leave it to long. Take out of refrigerator, pour in a bowl and mix with honey. Then top the fruit with coconut milk/honey mixture. It's soooooo good! 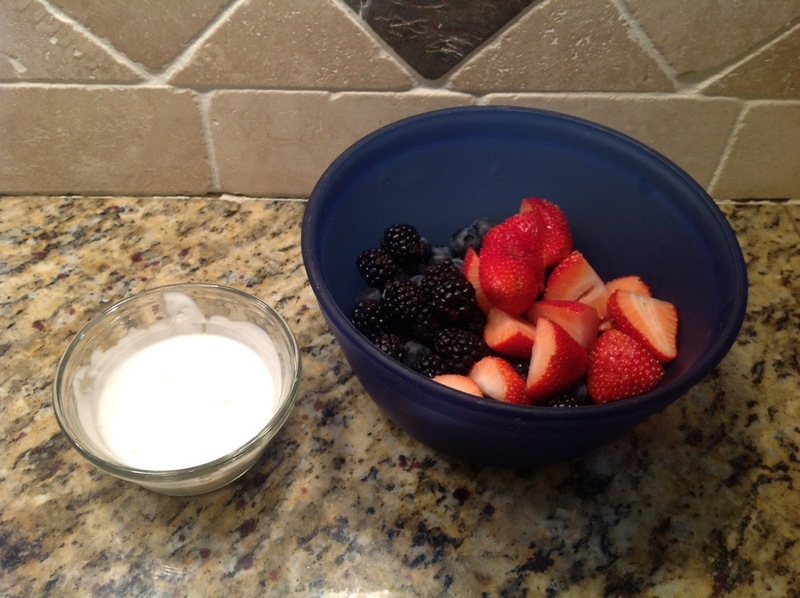 This entry was posted in Dessert, Thoughts From Fit Paleo Mom and tagged berries and cream., paleo berries and cream, paleo dessert. Bookmark the permalink.